Author. Writer. Trainer. Editorial Consultant. Editor. Communication Consultant. Mentor. Associate Professor. Teacher of English, Creative Writing, Research Writing, Speech Writing, Literature, Public Speaking, English as a Second Language. Workshop and Seminar Developer. Published. Bachelor of Science in Mathematics for Teachers. Master of Arts in Literature in English with a focus on Drama and Teaching Creative Writing. Carlos Palanca National Literary Awards winner. Winning Public Speaker. Working on a new initiative for newcomer artists in PEI takes a lot of work, a lot of networking, a lot of learning. I have met several wonderful artists who share a similar dream and the time feels right, feels ripe! I’m really looking forward to seeing this project come true and grow into something I only dreamed. If you are a newcomer artist to PEI, or if you know one, connect with us in Facebook: Artists From Away. 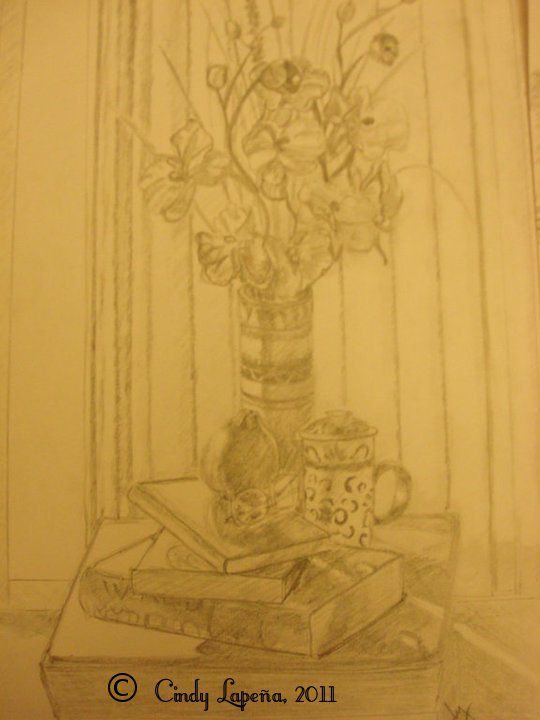 This drawing is an exercise in still life, picking objects that said something about me. I chose a few things that represent what I like to do in my down time or when I want to retreat from the real world–books, where I retreat into different worlds, encounter different characters, read different stories of different lives; books are something I also wish to write many of. The book in the bottom of the pile is a book on World Mythology, probably my favourite literary subject and something I have always wanted to explore and incorporate into my writing, my choreography, and perhaps, eventually into my art. My eyeglasses are my lens on everything. I grew up needing eyeglasses since I was 8 years old, and although I wore contact lenses for a few years when I was in college and a few years after, eyeglasses were practically an appendage on my face. My China mug, from China, was a Christmas present from an aunt, and represents comfort through the beverages it can hold–from hot cocoa to coffee to a variety of teas, even the occasional cold drink, although I generally take cold drinks from glasses or tumblers. The flower vase is a representation of something old, something tribal and authentic, something beautiful in its simplicity. It is a native bamboo tumbler made in the Southern Philippines, decorated with traditional patterns. It is a reminder that what is new cannot exist without what is old; that new things, new ideas, are rooted in old traditions. The last item in my pile is an orange, a segmented fruit that is presented as a single whole. It is like the world, segmented, capable of being taken apart, with each part as flavourful as the next, yet each segment capable of having a slightly different flavour, texture, juiciness, and colour from the next segment, some segments containing seeds, others without. Every segment connected through an intricate network of veins and held together by the skin. It can be anything from saccharine to bitter, sour, tart, or even flavourless. Even the colour is a combination of two other colours and any two varieties will have different shades, different flavours. It is a microcosm of the world–an orange, not an apple. 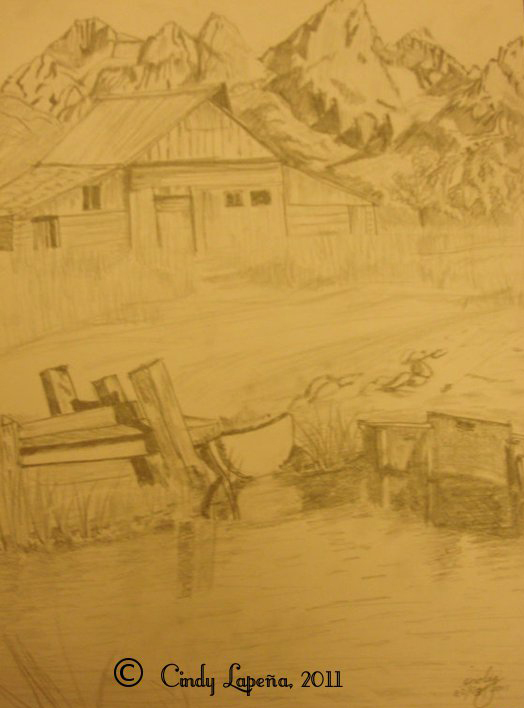 This sketch is an exercise in drawing landscapes. I decided to focus on the old barn as my subject with the water and small dam system in the foreground, and the mountains as a backdrop. This let me include the elements of water, mountains, and structure in a single composition. This is a commissioned work that I did for a colleague at work. 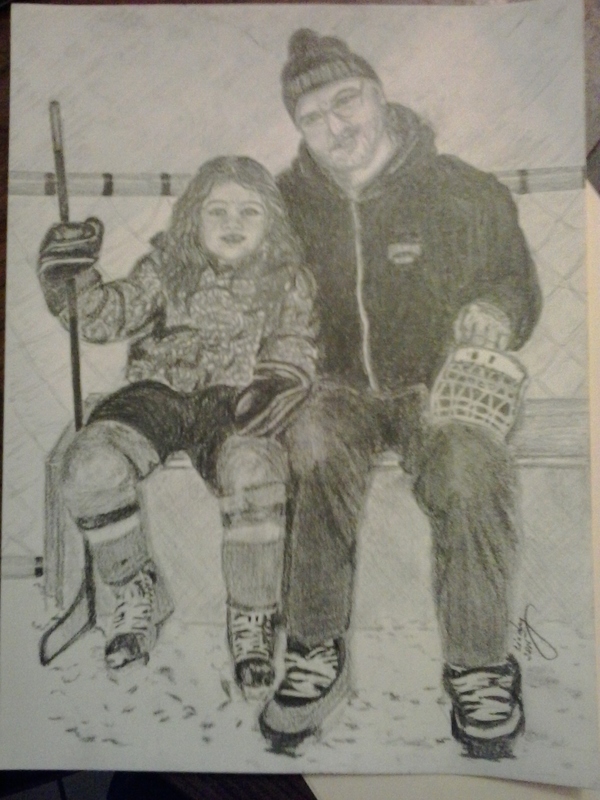 He wanted a portrait of himself with his granddaughter at the first and only time he played hockey with her, so that they would both remember the day.